Adorn your art and photos in this deep blue frame, designed by Artist Jane Seymour. 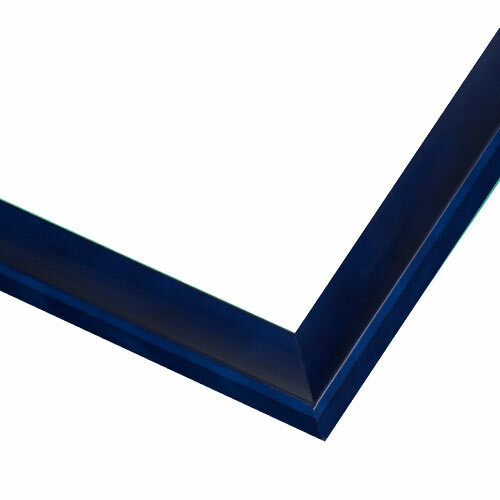 This simple yet elegant frame is finished in a navy blue lacquer. The classic profile makes it the perfect addition to any art or photo, while the soft and alluring mottled texture resembles waves crashing on the shore, adding unexpected interest. Think of this wood picture frame as the finishing touch to your masterpiece: perfect for framing nautical art and photos, fine art posters and more. The frame pieces themselves were of good quality. I ordered the wrong size based on what I understood of their measuring system. Customer service helped me to understand more clearly and I was able to return for partial credit. How to measure instructions are not the best but product itself was great. Evening setting on the puzzle being framed. You sent me a sample and I love it. I usually like it to go with a color in the photo but also like that color. A gift for family who love this selfie of me. I need frames to hang on the wall, how can I see what the back looks like? All of our frames come with hanging hardware designed to hang on walls. The back of most of our frames aren't finished as such they may not always be visually appealing. If you have any additional questions do not hesitate to contact our friendly framing experts at 1-800-332-8884 Monday through Friday. the back of the wood and composite frames are all the same, flat and unpainted. Wire hanging kit is usually included with the frame purchase. you may want to purchase some bumpers if doing large frames. I need a 53-3/4" Wide X 36" Height , can you supply that? BEST ANSWER: Hi Daniel. We do offer that size in most frames, but in this case, this frame cannot be made past 36". Our care team can certainly assist you in finding the perfect frame. They are available Monday-Friday 8am-7pm eastern time and can be reached at 1-800-332-8884. Thank you! Hello, I just finished chatting with your framing expert and they suggested taking advantage of your frame samples because I asked about returning if the color is not what I want. How do I ask for a frame sample of JSS3 Symphony Blue Lacquer Frame? Thank you for your inquiry. On each product page, there is a section that says "Can't Decide? Frame and Mat Samples Available." Select the radio button (circle) next to that section and a list of sample options becomes available. Select the sample type you want and add it to your cart. You can also place an order for a sample over the phone with one of our framing experts. For any additional questions do not hesitate to call us at 1-800-332-8884. Thank you and happy framing! Hi, it is really hard to see how blue the JSS3 frame is. Can you send another picture? Maybe a picture I can print? BEST ANSWER: Hello Jeannette! Thank you for inquiring about our Jane Seymour Blue Lacquer Satin Frame! As a courtesy to you, we are sending you a free 3" sample of the frame so that you may see the color up close. We want to make sure you are certain about the frame before you place the order. We normally charge $3.50 for the shipping for up to ten samples, however, we are sending this sample as a courtesy.If you need further assistance, please give us a call at 1-800-332-8884. Happy Framing.